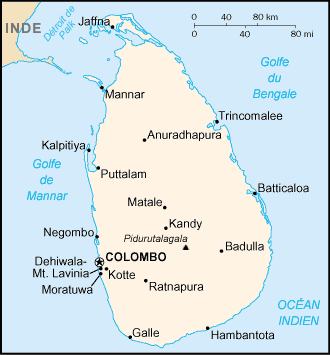 Sri Lanka : When and where to go? The climate in Sri Lanka is tropical, with an alternation between the monsoon and dry season that gradually sweeps through all regions of the island; however, this means that one part of the country is always enjoying great weather. The season of Yala, from May to August, brings heavy rains to the south, west and centre. Maha season takes in its turn the monsoon from October to January to the northern and eastern parts. It would therefore be more pleasant to visit the west and south from December to March, and the east from May to September to take advantage of the dry season. The temperature is constant at around 27 ° C on the coast, both the air and the water! Sri Lanka, "the resplendent island" is an enchanting place, which has various treasures to offer. Start by visiting Colombo, on foot: The Pettah bazaar, the Viharamahadevi Park with its splendid trees, the luxurious residences of Cinnamon Gardens and the Fort neighborhood are all to be discovered. Then follow with the spiritual heart of Sri Lanka, the city of Kandy: Set in a magnificent lake setting, enjoying a mild climate, it houses the Tooth Temple with its famous Buddhist Relic. Among the ancient cities of Sri Lanka, Anuradhapura is the largest, built around the Sri Maha Bodhi, the sacred banyan tree, which is 2,000 years of age. There are many museums and palaces there. Adam's Peak is another amazing place in the country: Marked with a footprint at the top, it is a place of constant pilgrimage during the dry season, and the subject of many legends which attribute the footprint to Adam, Buddha, St. Thomas, or Shiva. The Sri Lankans will add their smiles and generosity to these magical places and help make visits unforgettable. By air is the only way to visit to Sri Lanka, arriving at the Bandaranaike airport, 30 km from Colombo. A visa is not required for European nationals who do not wish to stay longer than 30 days. You can eat a meal for about 10€ (tip: ask for a full English breakfast in a hotel or a Sri Lankan breakfast at a nearby stall) and find a room for under 30€ in middle range hotels. It is also possible to rent houses (including staff!) belonging to foreigners who only use them for a few months, prices are reasonable and the locations are heavenly. In relation to health and hygiene, take care not to drink tap water or eat raw vegetables, milk and frozen products. Travel within the country is best by train or rental car. In the cities take a tuk-tuk or rent a bike. Possible souvenirs to take home: Precious stones, batiks, masks, spices, gold and silver jewellery, lace, leather and basketwork products.